A genuinely high-end, full-range partner for low-powered amps -- and much more besides. There's an old adage, at least in this part of the world, that it's easier to build efficiency into a speaker than power into an amplifier, yet it's a pearl of wisdom that is all but ignored by speaker and amplifier manufacturers alike. Of course, it comes with the considerable caveat that (where speaker enclosures are concerned) size can't matter, but, with that literally not-so-small proviso, it's a philosophy that has a lot going for it -- though like most such sayings it's somewhat simplistic. Even so, let's just dwell on the subject of efficiency for a moment or two. If we consider a hi-fi system's efficiency in terms of its ability to convert electrical power into acoustic output, then the results are pretty lamentable. Even horn systems with three-figure sensitivity score pretty poorly in this regard, so imagine what happens when you start building a speaker system with diminutive internal dimensions and still insist on extended bandwidth; not only does the sensitivity plummet but the impedance characteristic (and thus the load seen by the amplifier) turns something cruel. The end result is a loudspeaker that demands both considerable power and significant load tolerance. Now think about the combined energy and the sense of sheer scale and acoustic power generated by a hundred or so people beating, blowing or bowing musical instruments for all they're worth. Not really surprising, then, that most hi-fi systems fail so miserably when it comes to matching the dynamic range of live performances. The popular response is to simply seek ever-greater power output from the driving electronics, but to make matters worse, the engineering solutions required to even try to meet those demands are the very things that hobble an amplifier's ability to respond in a quick, agile fashion to the microdynamic shifts and textures that characterize the sound of individual instruments playing softly. Trying to achieve both goals is difficult; trying to achieve them simultaneously is darned near impossible -- which is exactly what makes higher-sensitivity speaker systems so appealing, at least on a philosophical level. The problems, naturally, tend to be of a more practical nature. Really efficient solutions such as horn-loaded enclosures are big -- and if you want to talk seriously full-range bandwidth, then huge is nearer the mark. The notion of hybrid systems coupling active bass units with horn loading for the midrange and treble is bedeviled with all the familiar challenges that typify other hybrid combinations, but with an even greater disparity in overall speed and response. And I haven't even got onto the subject of coloration yet! In practice, what you actually find is that the best solution is to meet halfway; forget the flea-powered amplification, with fewer watts than Chinese families have children, and aim for wringing as much sensitivity as you can from a relatively conventional box loudspeaker. The result will be an amp with somewhere between 15 and 25 watts driving a speaker rated at around 95dB, with system bandwidth depending on the size of the speaker enclosures and dynamic capabilities defined in no small part by the impedance characteristics of the crossover. Which notional ideal brings us finally and in a rather roundabout way to the subject of this review, the Coincident Pure Reference Extreme -- or PRE for short. Coincident have a history of convoluted and unusual product names, but even by their standards the PRE takes some explaining. It started life as a very tall, narrow and deep design dubbed the Pure Reference, but public demand led to a reconfiguration of the same driver lineup and crossover into a squat, four-box system with separate head and bass units, a bit like a WATT/Puppy combination but with deeper subcabinets and an Extreme suffix. It was a change that added a few extra performance niceties to the original design, as well as reducing its domestic impact, but the end result, the speaker we see and hear before us, is both special and true to the original concept. Let's start with a few numbers. How does a combination of 94dB sensitivity and a claimed 20Hz to 27kHz bandwidth grab you? Add to that the fact that the speaker's impedance is pretty much flat at 8 ohms, never dropping below 6, never rising above 10, and devoid of the nasty sharp corners that make for an awkward load and you'll begin to appreciate just how unusual this particular beast is -- especially when I add the fact that it sounds and seems even more efficient than those numbers suggest. But where things start to seem positively surreal is when you take a look at the driver lineup. Most high-efficiency designs resort to paper-cone drivers (often ma tched with silk domes, and eschewing doping in favor of lower mass), but that's not the case here. Instead, Coincident have opted for expensive, high-tech drivers from Accuton, as found in the likes of Avalon, Kharma and Marten loudspeakers. The woofers, too, are high-quality aluminum-coned models, more frequently found in far more conservative systems -- many of them notoriously difficult to drive. All of which rather raises the question: how have Coincident pulled this particular rabbit out of the hat -- and is the resulting animal still recognizable as its cute and cuddly self? The guiding principle here is low-loss design; start with the highest efficiency you can and lose as little of that as possible along the design path. By selecting a midrange driver and tweeter with inherently high sensitivity and wide bandwidth and combining them with sufficient low-frequency swept area -- in this case, two 12" aluminum drivers per channel, each with a humungous magnet for its motor -- not only can you ensure a sensibly high starting efficiency, but by using first-order slopes in the crossover you impose the least possible subtractive impact as well as the most benign impedance characteristic. In the case of the PRE, this equates to the range from 110Hz to 27kHz being covered by just a pair of drivers, each with a single component between it and the driving amplifier -- hence the "Pure" in the speakers' moniker. This is about as straight-line as it gets, unless you go to a full-range driver, and that opens a whole different can of worms! To take things further, Coincident specify increased power from the magnets fitted to their motor assemblies, further raising system sensitivity over stock drivers. The drivers themselves then receive additional anti-resonance treatment on their motors and baskets to help handle the increased mechanical energy created by the more powerful forces at work. But Coincident don't stop there. The PRE cabinets are constructed from 1"-thick, selected-grade MDF. Unlike standard MDF that primarily comprises soft-wood fibers, this is constructed from a mix of medium and hardwood fibers -- and considerably less glue. The result, according to the company, is a board that is about 30% denser, significantly more mechanically consistent and around 40% more rigid. The raw boards are balance veneered on both sides, which adds even more rigidity, and then CNC machined into panels which are spline jointed into extensively braced cabinets (and I do mean extensively). The separate head units are only just big enough to house the drivers, the diminutive dimensions again increasing rigidity, while the tapered and rounded baffle helps reduce diffraction effects. But it is in the woofer enclosures that you really see the benefits. All that effort expended on the rigidity of the materials and construction results in a cabinet resonance of 350Hz, compared to the 80Hz found in more conventional cabinets. That pushes the resonance well beyond the operating range of the drivers, allowing Coincident to dispense with internal wadding or damping of any description -- another potential drain on system energy levels. In addition, the higher resonant frequency allows the resulting energy to dissipate more readily, as well as create wider-spaced harmonics. As the cabinet resonance drops, the energy becomes harder to evacuate or convert to heat, which combined with harmonic modes at 160 and 320Hz (for an 80Hz fundamental) makes the cabinet effect far from inaudible. Coincident make a compelling case for their lightweight, rigid construction with its higher resonance -- a case that's powerfully supported by the sonic results. The broader cabinet of the Extreme moves the cabinet wall behind the bass drivers back by 4", reducing reflections through the woofer cone, further reducing blurring and compressive effects. All together this adds up to a significant impact on the apparent efficiency of the speaker system -- one of the main reasons the speakers sound even more sensitive than they are. The bass cabinets are supported on outrigger feet that further broaden their stance. These are bolted to the bottom of the cabinet and clamp against the sides, with soft rubber gaskets supplied to prevent damage to the speakers' finish. I'd strongly advise dispensing with the soft interface. The increased area and the fact that they contact both side and bottom panels makes these outriggers extremely effective transmitters of vibrational energy, helping to drain that energy into the floor -- providing you keep the path open. The contoured brass cones supplied are pretty effective in this regard, but swap to better spikes like the Track Audios, or an even more sophisticated solution like the Stillpoints Ultras, and the benefits are clearly audible, underlining just how effective those outriggers are. Once experienced, there's no going back, and virtually all of the critical listening with the PREs was done first with the Track feet and later with the Ultras installed. Which brings us to the second, less convenient implication of this experience. That 350Hz cabinet resonance might be well outside the operating range of the bass drivers, but it's slap bang in the middle of the all-important lower-mid frequencies generated by the head units -- the same head units that sit slap bang on top of the bass cabinets. Standard procedure is to isolate/anchor them in place with small blobs of Blu-Tack. However, substituting a trio of Stillpoints Ultras (caps down) between the head units and the bass cabinets wrought such a dramatic improvement in system integration and continuity that I'd consider that (or something similar) almost mandatory. With the Blu-Tack in situ there was a disjointed feel about the music, with neither rhythms nor soundstages really gelling across the range. Inserting the Ultras brought an immediate sense of continuity, linking the musical elements across the previous divide. The drive and momentum in the music, the sense of ensemble and the subtle chemistry that binds a band together, all were restored. Coincident actually offer a set of speaker stands so that the head units can be deployed separately from their bass cabinets -- the ideal solution, given that it allows the independent placement of each element to best effect -- but many of us won't have the space to consider a step that significantly increases the domestic impact of the speaker system. Given time, I'm intending to experiment with more cost-effective options, but for the present the Stillpoints are it. Other benefits accruing from the shift from the tall Pure Reference cabinet to the PRE four-box format is the elimination of considerable lengths of internal cable. Now your speaker cables attach directly to the gold-plate-over-copper binding posts, which in the case of the midrange driver means that the signal passes directly from there to the legs of the inductor hardwired between the terminal and the driver input tag. One practical consideration is that the terminals on the head unit and those on the bass unit are quite a distance apart, necessitating either biwires with very long tails at the speaker end or two sets of identical speaker cables, a possible additional cost if considering the PREs. Aside from the niceties outlined above, setup itself was extremely straightforward -- even if the care required was somewhere between excessive and obsessive, but I'll come back to that. The main decision to be made is whether to fire the side-mounted bass units into or out of the soundstage. Pointing them out gave a broader soundstage and a bit more weight (due to corner reinforcement), but firing them in produced better integration, linearity and transparency, which is what I opted for. Your room may well react differently, so you'll need to experiment, but this is one way in which the PREs can actually help with problematic room modes. Other than that, the speakers require minimal toe-in and extremely careful placement. The bass performance is so quick and agile that any discontinuities or padding are immediately apparent -- so much so that any change of driving electronics (or supporting spikes) will require an adjustment in speaker placement if you are not to disturb the immediacy and musical snap that makes these speakers so appealing. As well as adding the necessary isolation to the head units, the other thing to pay attention to is speaker rake angle. Start with them level but experiment with a small amount of forward tilt. It could be the extra height of the spacers between the cabinets, but in my room (with my sofa) a very slight down angle really locked things in, both rhythmically and in terms of soundstage focus and dimensionality. Finally, in my experience, all speakers using the Accuton drivers require fifteen minutes or so from cold to reach optimum performance, something that you should factor in to any critical listening. Depending on your point of view, calling any speaker the "Pure Reference Extreme" might be considered provocative or hyperbole, or a sign of a severe case of hubris. However, in this instance it's a remarkably accurate description, as long as you dig below the surface of the name's more obvious sense. Let's take the words one at a time and see how designer Israel Blume has arrived at this (slightly odd) nomenclature. First up is "Pure." Well, the PRE certainly has the sort of lucid clarity perhaps best described as purity, but as I've suggested above, how that is achieved is also instructive. The first and most obvious contribution comes from the chosen drivers. Anybody familiar with the Accuton ceramic units will attest to their inherently low distortion and coloration. But experience also suggests that what you do with the driver, how it is used, is just as important as the driver itself, and never more so than in this case. The lack of any padding, or extra warmth or weight emanating from the drivers themselves, makes any change in system topology all the more obvious. That these drivers are generally to be found in lower-efficiency systems, and that ultra low-coloration systems in general tend to be of lower efficiency, is down to their reliance on far more complex crossovers to flatten out the kinks in the speaker's system response. But low coloration wasn't the guiding principle behind the PRE's design; that was low loss -- hence the choice of an ultra-simple crossover network in combination with high-efficiency versions of the Accuton units. The low coloration arrives as a considerable bonus simply by dint of choosing the highest-quality drivers that were both suitable and available. Which brings us to the choice of the term "Reference." In many cases this is used to describe a fixed point. Once again, in the case of the PRE, we can put a more subtle meaning to the term. The creation of an ultra-low-coloration speaker system that also offers high efficiency and easy drive is, in my experience, unique. Any really low-coloration speaker throws the performance of the driving system into stark relief. It's something that I've gotten more used to since my introduction to the Avalon range, many of which also use their own versions of the Accuton drivers. Choice of driving electronics, and power amplifiers in particular, suddenly has a far greater impact on the overall musical capabilities and presentation of the system as a whole. On the one hand, the demands this imposes narrows the choice of partnering electronics. On the other, it creates a very real opportunity for the listener to tailor or slant the performance or presentation of the system. Of course, that's a dangerous game, given the fragility of the signal you are dealing with -- and just how easily its musical integrity and coherence can be disturbed. By adding the PRE's ease of drive and sensitivity into the equation, you aren't just opening the window wide on system performance, you are massively increasing the range of partnering options -- which way the window faces, if you will. Change anything and the PREs will let you know -- a situation that's compounded by the fact that you can change pretty much everything, so few limitations does the speaker impose on the driving system. And when I say "you can change pretty much everything," that includes the speaker itself. I've already discussed the various spike and support/spacing options I tried, the range of different placements that are possible, and I haven't even started on the wiring options. The point is, everything you change, every time you make a change, you'll hear the results. An example? We recently did some panel listening that involved the PREs as the speaker system. The assembled listeners, a mixed group of enthusiasts, journalists and distributors, expressed an interest in hearing the impact of Stillpoints products in the system as a whole, but in order to do that, it was necessary to explain that simply inserting the Ultras under the various pieces of equipment wasn't sufficient. We'd have to start with the speakers, adjust their positions to accommodate both the difference in height and spectral balance that resulted from installing the Stillpoints, then work our way back through the system from the source, before once again readjusting the speakers. Having finally completed this entire process, several things had left a strong impression on the listeners -- and not just the overall improvement in system performance. They were surprised that during the process the sonic steps might be forward or backward, before ultimately jelling with the final adjustments -- an experience that questions our whole approach to assessing supports and accessories. But I think what surprised them most of all was just how clearly these differences could be heard. The musical significance of even tiny shifts in speaker positioning -- a millimeter or so -- was both clearly audible and musically significant. It was a salutary lesson in just how critical and revealing the PREs can be. To me, this is the sense in which the Coincidents represent a reference. Not in the absolute sense, but in the way that they so clearly define any change in system performance: where you are, where you were and how great is the distance between the two. They serve as the audio equivalent of a microscope aimed squarely at system performance, which is quite definitely a double-edged sword. They will tell you how well your system works, whether you want to know that or not. Which brings us finally to "Extreme." By now, you should have pretty much worked out what's extreme about the PRE -- just about everything, from the scope it gives to driving or setup options, to the choice of ingredients used in the speaker itself. I had a salutary experience with the original Marten Coltrane. It arrived for review having been well used. I thrashed it some more and then reviewed it, reaching the conclusion that it exhibited some tonal leanness -- probably down to the ceramic drivers, or so I concluded. I got the very same pair of Coltranes back around a year later, only to discover that they'd blossomed out of all recognition: no shortage of harmonics or tonal color, no lack of body or weight. The simple fact is that the speakers took an inordinate amount of time to run in -- longer even than my most skeptical estimate. The PREs might have a much simpler crossover than the Coltranes, but otherwise the similarities are there to be seen (and heard). You will need to run these speakers day and night, day and night -- and for a lot longer than you think. Then you'll need to run them some more before you hear what they're really capable of. The review pair has around 2000 hours on them, and they're still getting better! That's what I mean by "Extreme." Whilst the Coincidents are not particularly difficult to get sounding good, they reward every bit of extra care and attention that goes into them and the system. Exhibit extreme care and attention to detail and they won't just sound good, they'll sound truly great. Pure Reference Extreme isn't a sentence; it's three words that describe both the speaker and the demands it will place on both the listener and the system. Of course, the range of options, the sheer versatility embodied in the PRE, presents a considerable challenge. It also presents a very real opportunity. The Coincident PREs have enjoyed a lengthy period under review, during which time they've taken turn and turnabout with the Focal Stella Utopia EM ($90,000/pair), a larger, much more expensive speaker but one that is, on paper at least, remarkably similar in terms of overall efficiency and bandwidth, as well as size (if not shape). In practice, the two couldn't be more different, sonically, stylistically or in terms of the specific demands they place on the driving system -- but more of that later. The extended period in residence has also meant that the PREs have been paired with an unusually broad range of partnering amplification, spending time hooked up to the Rowland 625, the Berning Quadrature Z monoblocks, the VTL MB-450 IIIs, the Jadis JA-30s and Coincident's own Frankenstein II M300Bs, each instance being far more than a fleeting acquaintance. I mention this for two reasons: first, because each and every pairing was successful on musical and sonic grounds; and second, because never have the differences between such different amps been so apparent. Ranging from OTL to SET, high-powered solid-state to both high- and low-powered push-pull tube units, it was almost like a guided tour of each competing topology's strengths and, to a far lesser extent, weaknesses. Rather than highlighting the driving amplifiers' flaws, the PREs seem to cleave to and major on the things it does well. Or perhaps, to be more accurate, it gets out of the way to such an extent that what you hear, what you concentrate on, is what the driving amplifier chooses to show you. Of course, all of these amplifiers (and yes, I'm including the Frankensteins, which are both genuinely high end and genuinely a bargain) are outstanding examples of their respective breeds -- otherwise they wouldn't be taking up house space. What impressed me was just how easily the PREs displayed what makes each one special and what separates one from another. The most distinctive pairing was the all-Coincident setup, especially when the matching line stage was factored in. The Frankensteins brought exactly the measure of color and warmth you'd expect from a 300B design, making the sound of the speaker more "conventionally" balanced. What they lost was the absolute in transparency, resolution and focus that amps like the Bernings deliver -- and that's exactly the point. 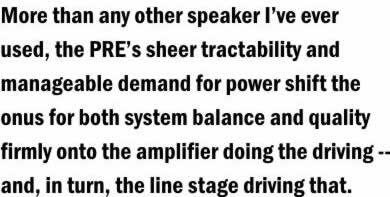 More than any other speaker I've ever used, the PRE's sheer tractability and manageable demand for power shift the onus for both system balance and quality firmly onto the amplifier doing the driving -- and, in turn, the line stage driving that. If you value tonality and harmonic purity, then the Frankensteins will deliver (as would the Lamm ML2.2s, amps I'd love to hear with the PRE). If clarity and effortlessly natural dynamic resolution are your passion, then the Bernings will be just your cup of tea, while amps like those from Jadis, VTL, Rowland and others, will be spread along the continuum in between. Which is another way of saying that not only will the PREs accommodate pretty much any amplifier you choose, they'll give you more of why you chose it in the first place. Which is not to say that the Coincident speakers are without a character of their own; the invisible speaker has yet to be built! Listening across all these amplifiers, key similarities in presentation started to emerge. How do these speakers sound? Not the way you might expect -- or at least not the way most near-$30,000 speaker systems sound. The PREs are quick, agile and dynamically uninhibited. There's little or no sense of lost energy -- which may not be something that you think about when assessing speakers, unless you put them side by side with something like these Coincidents. Of course, that's the essential fact of any high-efficiency design; it is, after all, what the term implies. But once you start talking speakers, certain assumptions start to apply, the most obvious being that most high-efficiency speaker systems are also limited in bandwidth (in some cases, severely so). Those -3dB points at 20Hz and 27kHz should tell you that the PRE doesn't lack bandwidth, at least on paper. But experience tells us that there are lies, damned lies and the numbers that people apply to loudspeaker performance. In this case, it's not about the bandwidth but how it's delivered -- a question of style over substance, if you will. When I say that the PREs don't lose energy, I mean that they don't lose energy right across their range, not just across their midband. But they can't deny the laws of physics, so those drivers in a box of that size, even with super-efficient motors, can still only move so much air. What any speaker design has to decide is whether to move more air at slightly higher frequencies or accept a loss of weight and power as it reaches as far down as it possibly can. Bass performance is crucial to the sound, musical integrity and presentation of any speaker; we use the term "fundamentals" for a reason. You only have to sit down and listen to half a dozen loudspeaker models to appreciate that there are as many solutions to this particular problem as there are speaker designers -- and that some are far more successful than others. From which realization it is only a short step to the understanding that nearly all speakers depend, to a greater or lesser extent, on sonic sleight of hand to convince us that they generate more bass weight/depth/texture/impact (delete as appropriate) than they actually should. We even have a name for the process -- bass voicing. The end result is that, rather like drinking tea or coffee with sugar, we come to expect that additive sensation. Done well it can be incredibly convincing -- and enjoyable. But it also subtly skews our expectations when presented with any new speaker. We subconsciously equate size, price and driver complement in an erroneous equation that generates an "answer" -- the anticipated bass weight and performance. The PRE flies straight in the face of fashion, and once again the clues can be found clearly stated in the moniker. Pure and Extreme: two words that in this case can be taken to imply nothing added and nothing taken away, a rule applied right across the range, and that means right to the very bottom of the speaker's audible output. The PRE's bass enclosure is rear reflex loaded by a port of a depth and diameter you'd normally associate with a smallish stand-mounted speaker -- not the sort of howitzer barrel(s) you normally find on a speaker of this size and price. In the Coincident, the reflex loading is more about bass control than augmentation. The result is a low-frequency performance that reaches down to the magic 20Hz mark, but gets lighter in weight (if not any slower in speed or narrower in dynamic range) the lower it goes. On paper, speakers like Avalon's Isis or the massive Focal Grande Utopia EM barely reach any deeper, but there's no mistaking the sheer weight and power that they can generate well down into the musical nether regions -- or the presentational benefits that accrue. Compared to genuinely full-range speaker systems, the Coincident PRE lacks the ability to deliver the sort of bass weight that physically assaults the listener -- and that some high-end customers find so impressive. More important, it also lacks the really deep bass output that is necessary to generate the sort of convincingly defined acoustic space, dimensionality and boundaries that you get from speakers like the Grande and the Isis, as well as the massive four-box tower systems represented by the likes of the big Infinity, Genesis or Scaena setups. If counting the bricks behind the curtains at the back of Orchestra Hall is what lights your candle, the Coincidents could leave you feeling rather limp and soggy. But then there's bass and bass, and every speaker that I've listed is considerably bigger and considerably more expensive than the PRE. By any other standards the Coincidents deliver bass that might lack the sheer weight and impact of some of the nearer competition, but will almost without exception better them in the realms of pitch definition, pace, texture, timing and actual information. That's because those speakers that deliver that extra weight and the hyped impact that goes with it do so by adding energy where it shouldn't actually be. The inevitable result is a thickening of textures, a loss of transparency and a slowing of arrival times and real dynamic response. It amazes me how often these characteristics are described as "warmth" or "musicality," labels that indicate clearly just how addictive and normal they've become. What they ignore is that the results, no matter how impressive they might seem, are neither accurate nor real. The thing that makes the PREs so special is that all their transparency and agility, just like their energy, extends right across the range. Images are firmly focused and extremely stable, with excellent layering within the soundstage and superb width. Depth is natural (not the exaggerated tunnel vision that some systems provide) and height and air are both beautifully clear, whether it's the relative height of the musicians or the space around and above them. In turn, that places the focus of the listener's attention firmly front and center. The immediacy of the musical energy, the lack of barrier, includes the listener within the same acoustic space as the musicians, yet it does so without the presentation being either bright or forward. That clarity extends beyond the central performers, out and back into the stage, clearly defining the relative position of each player, each section in an orchestra -- but much more importantly, locking in the musical relationship between their parts, their instruments or voices. It could almost be termed "listening inside out." And it is, naturally, the exact opposite of "listening outside in"! Time, I think, for a few specifics. Let's start with Act II of Tosca, a Japanese pressing of the Philips recording, Caballe, Carreras and Wixell from the ROH, conducted by Colin Davis [Philips 6700108]. It's a recording and a performance that are justifiably renowned. Caballe at her best, paired with a young Carreras, while Wixell makes a wonderfully threatening Scarpia. Act II opens with a short instrumental introduction that immediately establishes the spread and layout of the orchestra, as well as the authority of its bottom end as the descending phrases prepare for the evil scheming of Scarpia to be revealed. Wixell's entrance is rock solid, his rich baritone clearly underpinned by his barrel-like chest. The spatial separation between Scarpia and Cavardossi is explicit while the hand-bell is perfectly defined, sonically, in space and in height, adding to the sense of staging in what is actually not a performance recording. The dramatic orchestral punctuation has real, explosive dynamic range, underlining just how sudden the dynamics of real life are, how far and how fast energy levels can jump. All of which is mightily musically impressive. But for those wanting to know just how the PREs contribute to the experience, there are some key indicators here. The clear tonal and spatial separation of baritone and bass, as well as tenor once Carreras enters, accentuates just how uncluttered and tonally faithful the Coincident speakers are -- and just how easy that makes it to follow musical or instrumental lines and structures. Vocal and instrumental separation are never in question, each voice, each instrument having its own natural and clearly identified character. The deep-bass arpeggios, bass-drum detonations and the gusto of the brass tuttis clearly demonstrate just how fast and informative the PREs' bottom end really is -- and just how much impact the speakers' low-frequency performance delivers, when and only when it's really called for. Witness the finale of Act I: soloists, a full opera chorus and orchestra, all in full cry, takes some beating for sheer scale and musical drama, but the Coincidents don't disappoint, pinning you to the seat with their expressive musical power rather than clumsy acoustic wallop. Even when the bass notes literally shake the room, the layers and subtlety further up the range remain intact. There is no thickening or loss of the translucent clarity that allows you to separate each and every musician or voice. This is the most compact and affordable (everything is relative) speaker I've ever used that manages to float bowed bass convincingly, delivering pitch and texture. Bass drums have skin and volume, rather than just a heavy thud, while tuba really rips the air. If you listen to live orchestral music on a regular basis you'll instantly recognize the honesty here, where bass instruments exist, each clearly identifiable and independent of the constant, waffling rumble that so many hi-fi systems deliver. It's a truly impressive, genuine performance that rewards those in search of musical insight rather than the sonically impressive. And it's all down to the sheer linearity of the bass output and the lack of added baggage, the insistence on a properly engineered low-frequency solution without any shaping for "effect." The other aspect of the PREs' dynamic performance that mirrors life more accurately than most of the competition is their ability to shift dynamic density. The difference between the scale and power of a single voice, even a Wixell, and the full orchestra is the constant challenge facing the operatic conductor. Yet here, as Davis propels and accents Wixell's words with dramatic orchestral interjections, that balance is both perfectly preserved and laid bare. The speaker manages to jump from solo voice to orchestral tutti without any wind up or lag. When it jumps it doesn't just tell you how high, it tells you how much as well, knowledge that's self evident in live performances yet so often missing from the translation of signal into sound in hi-fi systems, limited both in scope and rate of change. Likewise, the distant cantata indicating Tosca's presence is clearly coming from afar, beautifully intelligible despite its muted level. This ability not just to jump between dynamic demands but to allow different musical strands to coexist independent of level is, again, a test that too many speaker systems fail. This performance of Tosca is possibly the most dramatic, the most musically visceral example of listening inside out. This is all about presence and involvement, being inside the event. It's also the polar opposite of looking in on a perfectly scaled, spatially defined and constrained facsimile of the performance, complete with midhall balance and dynamics that reach you from "over there." For so long, that image of stereo presentation, the walk-in soundstage beyond some virtual Proscenium arch, has dominated high-end perception. Yet achieving it has, in all but a very few instances, involved emasculating the sheer scale and drama of the original event. That padding of the musical foundations goes hand in hand with a thickening that disturbs the pace and timing of the performance, muddles the instrumental relationships and stifles the music's immediacy, expressive range and impact. This musically inclusive quality I so admire in the PRE is one it shares with the Focal Grande and even more so than with the Stella, both of which enjoy the benefits of the EM driver delivering speed and clarity through the low and, in the case of the latter, the vital midbass. Again, so much of what these speakers deliver in terms of sheer musical clarity, communication and involvement is down to that bass transparency and the refusal to over-egg the low-frequency pudding. It's a lesson that's easily demonstrated with the Focals' easily adjustable bass response; it's a lesson that is fully realized in the shape of the PRE and one that places the Coincident speakers' performance in some pretty exalted company. Time and again, familiar recordings exhibit these same traits: the inclusive quality, the immediacy, the focus on the performers and the structure of the performance as opposed to the space between the performers and enclosing the performance. "True Love Ways": perfect separation and placement, laterally and in terms of height, of the instruments, Buddy Holly's voice and the control room speakers. The back wall is indistinct, as is the sense of the enclosed live environment. "This One's For Blanton," Janis Ian's "Some People's Lives," Basie's "Farmers Market Barbeque": the same applies each time, familiar music given a new sense of focus and emphasis, a new sense of performance and purpose. The Yepes/Argenta Concierto De Aranjuez [Alhambra SCLL 14000] is an eerily apposite example. Having just heard Craig Ogden and the LPO play the piece, listening to Argenta's reading on the PREs really does bring home the exquisite quality of Yepes' playing, his absolute mastery of both the instrument and the score -- even if you do lose some of the holographic qualities in the recording. It's a balance of virtues I'll happily accept, placing the musical in advance of the atmospheric/cosmetic. We can argue about the importance of imaging, and believe me I'm an advocate. But what I want, and what I get from the PRE in this regard, is defined sound sources that are stable in space, delineated in depth and height. Spatially, the speaker defines the relationship between the performers -- and does so with tremendous clarity. First impressions might be that the Coincidents lack some depth, but they don't. What they lack is that clearly defined rear wall that does so much to create the sense of depth. How can I be so adamant? Confronted with this very conundrum I paid particular attention to the impression of depth at several live performances, in different venues. Listening live, what I hear is actually closer to the PRE, but I sit well forward in most halls. Further back and the balance shifts; there is more reflected energy, a greater sense of the overall acoustic. Whether you are buying concert tickets or hi-fi, you pays your money and makes your choice. Besides which, if you really want that added weight and you've got the space, you can always stack a second set of woofer units atop the first. It might sound an unlikely solution, but Coincident have actually sold half a dozen sets of double PREs -- including doubled-up head units! It's high time to draw some sort of conclusion. I'v e spent a lot of time talking about the way the PREs work -- both what they do and how they do it. I've really only looked at a single musical example in detail, albeit one that embraces the full gamut of musical demands. But that is because the "how" is so critical to the "what," and also what separates the PRE from virtually all other speakers. Ask yourself this: how many full-range, high-efficiency speaker systems are there on the market? How many of those represent an easy load to the driving amplifier and offer exemplary levels of tonal neutrality coupled to truly wide-range dynamics? The PRE's specific blend of virtues is, in my experience, unique. But, more important, those virtues are also musically important, highlighting not just the differences between live and recorded sound, but the role our expectations play in the way we listen, what we listen to and what we listen for. Hi-fi systems don't sound remotely like live music. What they do is give us a set of clues, a sense of structure and shape that allows us to reconstruct the live event. The better the system, the easier that task -- and the more rewarding the exercise. What the PREs do is deliver a different viewpoint, with different clues. It's a perspective that can move you closer to the recorded event but also reveals the nature of the gap we've come to accept as part and parcel of hi-fi artifice. It's an impressive and thought-provoking performance. It also sounds really, really good and, to my ears, less like hi-fi and more like music than anything at or close to the price. The Coincident PREs are not the prettiest speakers I've had at home, and they're not the best presented. They don't necessarily tick the luxury product boxes that the $26,800 price tag suggests they should -- and your friends won't marvel at their standard of fit'n'finish. The "ooohs" and "aaahs" that greet a speaker like the Focal Stella Utopia EM, with its sculptural appearance and flawless paint finish, will be forever alien to the PRE, but then the PRE costs around a third of the price yet challenges the performance envelope of the French model, winning out in some areas, being shaded in others. This is performance audio -- pure and simple. It's the performance that matters -- the performance, the one on the disc! And boy, do these speakers deliver. I'm still just chipping the surface with the PREs. The problem is that I keep finding myself looking both ways: I love the insight they offer into the music, and I'm fascinated by what they tell me about the way the driving system works. But ultimately the conclusion here is inescapable: this speaker does something both very different and very right -- and I believe that what it suggests about audio systems in general, as well as how we listen to them, is potentially very important. When all is said and done, summing up this speaker in three words really is as simple as "Pure," "Reference" and "Extreme." Analog: VPI Classic 3+ turntable with VPI JMW 12" and Tri-Planar Mk VII UII tonearms; Lyra Titan, Skala, Dorian and Dorian Mono cartridges; Clearaudio Goldfinger Statement and van den Hul Condor cartridges; Connoisseur 4.2 and Coincident Speaker Technology Statement phono stages. Digital: Wadia S7i CD player, dCS Paganini three-box digital front-end, Jeff Rowland Aeris digital-to-analog converter. Preamplifiers: Connoisseur 4.2, VTL TL-7.5 Series III and Coincident Speaker Technology Statement line stages. Power amplifiers: Jeff Rowland 625 stereo amp, Berning Quadrature Z, VTL MB-450 Signature Series III, Jadis JA-30, and Coincident Speaker Technology M300B Frankenstein Mk II monoblocks. Integrated amplifier: Icon Audio Stereo 60 Signature. Speakers: Focal Stella Utopia EM, Sonus Faber Cremona. Cables: Nordost Odin throughout the system, from AC socket to speaker terminals. Power distribution was via Quantum QRT QB8s with a mix of QX2 and QX4 power purifiers and QV2 AC harmonizers. Supports: Racks are finite elemente HD-04 Master Reference racks and amp stands along with a 26"-wide Stillpoints ESS. These are used with equipment couplers throughout, either Stillponts or Nordost SortKones. Cables are elevated on Ayre Myrtle wood blocks. Accessories: Feickert protractor and Aestetix cartridge demagnetizer, a precision spirit level and laser, a really long tape measure, and plenty of masking tape. Also extensive use of the Furutech anti-static and demagnetizing devices and the VPI HW27 Typhoon record-cleaning machine.